The knee is a complex joint that is difficult to model accurately. Although significant advances have been made in mathematical modeling, these have yet to be successfully validated in vivo. Direct measurement of knee forces could lead to a better understanding of the stresses seen in total knee arthroplasty. This would enable more accurate mathematical and in vitro modeling of the knee, which could then be used to evaluate and to implement relevant improvements in implant design. An instrumented knee prosthesis was used for wireless measurement of tibial forces. Accurate measurement of these forces can yield insights into the stresses generated during common activities of daily living. The tibiofemoral force data can be used to develop better biomechanical knee models and in vitro wear tests and can be used to evaluate the effect of improvements in implant design and bearing surfaces, rehabilitation protocols, and orthotics. 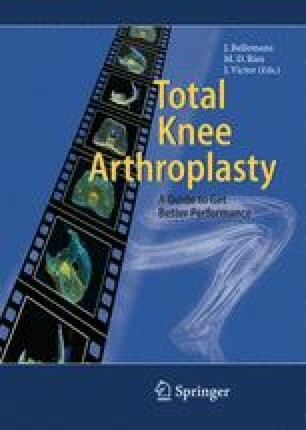 This may lead to refinement of surgical techniques and to enhancement of prosthetic design that will improve the function, quality of life, and longevity of total knee arthroplasty. Given the current increase in the number of older persons who are at higher risk for chronic musculoskeletal disorders, a significant positive impact on clinical outcomes and patient health care could be anticipated.